The Ashta Mathas in Udupi are the eight Hindu monasteries situated in the Udupi town of Karnataka, instituted by the founder of the Dvaita school of Hindu philosophy, Saint Madhvacharya. The eight (Ashta) Mathas (monasteries), established by Saint Madhvacharya, were named after the villages they’re located at, namely: Palimaru, Adumaru, Krishnapura, Puttige, Shiroor, Sode, Kaniyooru and Pejavara. Subsequently, the headquarters of all the eight monasteries were placed around the famous Udupi Shri Krishna Matha with their own buildings. While forming the monasteries, Saint Madhvacharya gave each of the eight Mathas a deity for daily worship. These deities are the four avatars of Lord Vishnu, namely, Krishna (Vittala), Rama, Narasimha and Varaha. It is believed that eight is the favorite number of Lord Krishna, who was also the eighth child of Vasudeva and Devaki. Ever since their inception centuries ago, the Mathas have been living up to their roles of upholding Saint Madhvacharya’s Dvaita philosophy that propagates a dualistic theory that the Supreme Soul (Lord Vishnu) has an existence separate from the individual souls. The Ashta Mathas in Udupi, or the eight Hindu monasteries were founded by the initiator, preceptor and propagator of the Dvaita philosophy of Hindu Vedanta, Saint Madhvacharya. These eight Mathas were created to preach and disseminate the lessons of the Vedas, Vedanta and the Tatvavada philosophy. Each of the eight Mathas got their names from their original place or village of inception. It was later that the headquarters of all the eight monasteries were shifted to the Udupi town, around the famous Shri Krishna Matha. After founding the Shri Krishna Matha in the 13th century, the Saint Madhvacharya entrusted the Ashta Mathas to collectively manage the Shri Krishna Matha. In order to carry out the management of these eight Mathas, as well as to disseminate the Tatvavada philosophy, and the lessons of the Vedas and the Vedanta, Saint Madhvacharya had initiated Sanyasa to eight of his ascetic disciples and ordained them as the first Swamis or heads of the respective Mathas. At the time of the coronation of the Swamijis as heads of the Mathas, a suffix of ‘Teertha’ was added to their names. Hence, those eight Teerthas had begun the legacy of the Ashta Mathas, and their respective lineage is faithfully carrying this much treasured and divinely revered heritage ahead. The Ashta Mathas are vested with the responsibility of carrying out the administration, rituals, customs, and offerings at the Udupi Shri Krishna Matha. Each of these Ashta Mathas takes the managerial responsibility of the Udupi Shri Krishna Matha for two years in cyclic order. This formal rotation scheme is called Paryaya. At the time of the formation of the Ashta Mathas, Saint Madhvacharya initiated the Swamijis of the Mathas in pairs, thus pairing the Mathas as well, namely: Palimaru and Adamaru; Krishnapura and Puttige; Shirur and Sode; and Kaniyooru and Pejavara. Each pair of these Mathas is called Dwandva (dual). If a situation arises where the current Paryaya head faces difficulties in smoothly performing his responsibilities, the Swamiji from the Dwandva Matha undertakes those responsibilities. The main branch of this Matha is situated 30 km from Udupi at a village called Palimaru in the Padubidri Taluk. Shri Hrishikesha Teertha was the first head of Palimaru Matha. He was also the first Swami coroneted by Saint Madhvacharya. Sri Vidyadheesha Teertha is the reigning Swamiji of the Matha, and is the 29th seer in the lineage. Saint Madhvacharya offered the idols of Lord Kodandapaani Shri Ramachandra, along with Sita, Hanuman and Lakshman to the first head of the Matha. Working on the Mathas’ chief objective of disseminating Vedic and Vedantic lessons, the Palimaru Matha also runs a school by name of Shri Yoga Deepika, imparting daily classes to around 100 students. 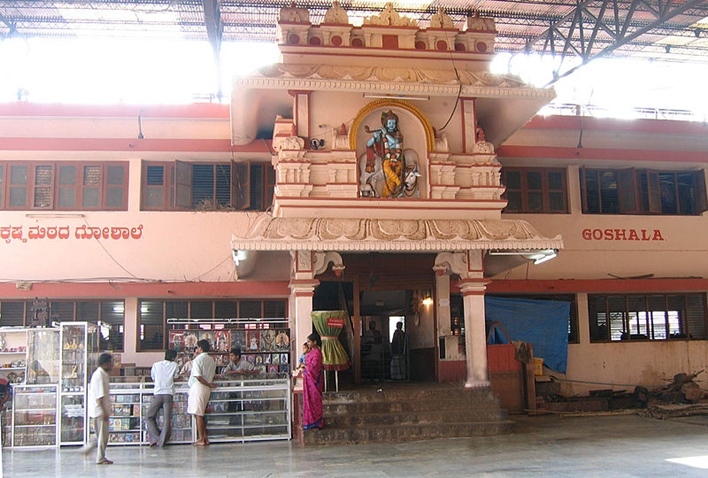 Located on the northern side of the Car Street, next to the Palimaru Matha near the Shri Krishna temple at Udupi, the main branch of the Krishnapura Matha is situated at the Krishnapura village near Surathkal in the Mangalore Taluk, around 45 km from Udupi. Shri Janardhan Teertha was the first head of this monastery, while Shri Vidyasagara Teertha is the current pontiff. Saint Madhvacharya gave the deity of Kaliya Mardhana Shri Krishna to this Matha. The Shiroor Matha is situated on the right side of the Shri Krishna Temple, in front of the Kanaka’s shrine. The main branch of this Matha is situated at the Shiroor village, around 21 km from the Udupi town, near Hiriadka in the Udupi Taluk. Saint Madhvacharya ordained Shri Vamana Teertha as the first head of this Matha. The saint had gifted the idol of Vittala along with Shri Devi and Bhudevi to the first Teertha of the Krishnapura Matha for worship. In order to distinguish this Vittala from others, the name Vamana Vittala is given to the idol. Shri Lakhmivara Teertha is the present chief of the Matha. He is the 30th pontiff in the lineage. Kaniyooru Matha is the first monastery to be seen on emerging from the Udupi Shri Krishna Temple. The main branch of this Tulu monastery is situated at the Kaniyooru village, around 145 km from the Udupi town, near Kukke Subramanya in the Sullia Taluk in South Karnataka. Shri Rama Teertha, a direct disciple of Saint Madhvacharya, was the first chief of the Kaniyooru Matha. Subsequently, 29 pontiffs held the coveted post, performing their duties to perfection. Sri Vidya Vallabha Teertha is the reigning head at present. Shri Rama Teertha was gifted the idol of Shri Yoga Narasimha by Saint Madhvacharya, which is worshipped with absolute devotion at the Matha. This is the second Matha that one can see while proceeding at the Car Street from the Shri Krishna Temple. Its main branch is situated at the Sode village near the town of Sirsi in the Sirsi Taluk in North Karnataka, some 224 km from Udupi. In the earlier times, this Matha was associated to a place called Kumbashi, and hence was called the Kumbashi Matha. It was later, during the chiefdom of Shri Vadiraja Teertha that the Matha came to be known as the Sode Matha. Shri Vishnu Teertha, the younger brother of Saint Madhvacharya, was the first head of this Matha, who was gifted the idol of Bhu Varaha for worship by the saint. It is believed that Shri Vishnu Teertha is still performing a deep penance somewhere in the Kumaradri Hills. Shri Vishwa Vallabha Teertha is the current pontiff of the Sode Matha. The Puttige Matha stands next to the Sode Matha near the Udupi Shri Krishna Temple. Its chief branch is located at the Puttige village, around 21 km from the Udupi town, in the Udupi Taluk. Shri Upendra Teertha was the pioneering Swamiji of the Puttige Matha, who was handed the responsibility of daily ritualistic worship of Shri Vittala by the Ashta Matha founder, Saint Madhvacharya. The present pontiff of this monastery is Shri Sugunendra Teertha. This is the fourth Matha in the order of chronology from the Udupi Shri Krishna Temple. The main branch of this Matha rests at a place called Admar, around 21 km from the Udupi town, in the Udupi Taluk. The original head of this Matha, Shri Narasimha Teertha has entrusted the devoted responsibility of worshipping a Kalinga Mardhana Shri Krishna idol by his Guru, Saint Madhvacharya. The all-important role of heading this Matha rests with Shri Vishwa Priya Teertha at present. Pejavara Matha stands next to the Adamaru Matha, while its main branch is situated at the Pejavara village, 55 km from the town of Udupi, in the Mangalore Taluk in South Karnataka. Shri Adhokshaja Teertha was ordained by Saint Madhvacharya as the first head of the Pejavara Matha. The current pontiff of the Matha is Shri Vishwesha Teertha. Shri Vishwa Prasanna Teertha is the junior pontiff of this Matha. It would be only a formality to mention that one must visit the Shri Krishna Matha while visiting the Udupi Ashta Mathas, because usually it is the other way round. People throng the Udupi Shri Krishna Matha, following which they inevitably pay visits to the Ashta Mathas within close vicinity of the Temple. The usual norm while visiting the Shri Krishna Matha is to first pay visits to the Ananteshwara and the Chandreshwara Temples situated close by. It’s only after paying obeisance at these two temples that one can ideally step into the temple of Shri Krishna. As per a tale from mythology, a pious king and devotee of Lord Parashurama by the name of Rama Bhoja had mounted the statue of Lord Shiva (also known as Lord Ananteshwara) at the place. Another legend goes that the Chandreshwara temple was erected at the very place where Chandra had performed a prodigious sacrament for getting rid of King Daksha Prajapathi’s curse. Following a devotional dip at the Udupi Shri Krishna Temple, the Mahathobhara Shri Vishwanatha Temple would make for a soulful stop for sure. Located only 8 km from Udupi at the Yellur village, the Mahathobhara Shri Vishwanatha Temple is yet another strutting dedication to Lord Shiva in the Southern India. Hoards of devotees from across the country throng the temple throughout the year. Legends say that the Vaishnavite saint Madhvacharya had discovered Lord Balkrishna’s idol, installed at the Shri Krishna Temple, inside a large rock made from sandalwood paste. He received this rock as a gift from a sailor whose ship he’d saved from a fatal storm in the ocean while the saint was meditating on the Maple shore. This little piece of anecdote in itself makes the Malpe Beach a must-visit for the devotees who’d just paid a visit to the Ashta Mathas as well as the Shri Krishna Matha. Covering a distance of hardly 4 km from the Ashta Mathas, the Maple Beach is a pristine beach holding pivotal importance as a fishing harbor. Added to this the place’s religious and spiritual significance, this beach ought not to be missed. The closest railway station to the Ashta Mathas is Udupi. You can also consider the Mangalore Railway Station. Buses and taxis are also available from there to Udupi. If you are planning for an air travel, Mangalore would be the nearest airport. If coming from Bangalore, you can fly from Bangalore to Mangalore, from where taxis ply frequently to Udupi. Regular buses, both the KSRTC as well as the private ones, operate to and fro Mangalore and Udupi. If you plan to start your journey from Bangalore, board a bus for Udupi, taking over eight hours of travel. You may also want to drive your private vehicle or reserve a cab from Bangalore that shall take around five and half hours of traveling.